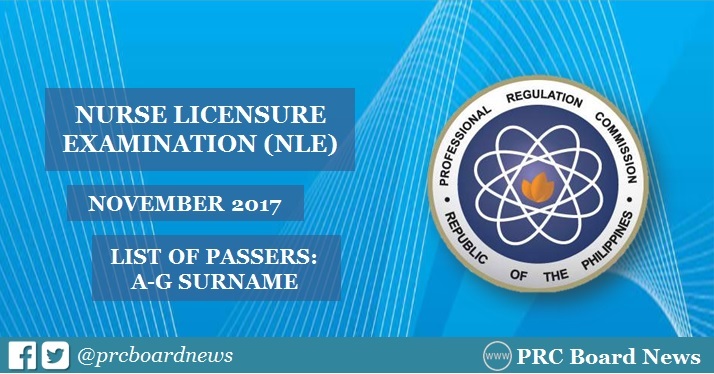 MANILA, Philippines - The Professional Regulation Commission (PRC) released result of November 2017 nursing board exam (NLE) on Tuesday, December 12, 2017 or in 11 working days after the last day of exam. PRC administered the NLE on Saturday and Sunday, November 25 and 26, in Manila, all regional offices nationwide (Baguio, Cagayan De Oro, Cebu, Davao, Iloilo, Legazpi, Lucena, Pagadian, Tacloban, Tuguegarao) and Zamboanga. The full list of passers in alphabetical order (A-G) surname is available here. I have read many articles and this kinda blogs are my favorite. The most beautiful thing about this page is that we can have evidence based practice paper at literaturereviewwritingservice.com which is free of cost. I am happy that people are now aware online fir every small news. This site https://www.personalstatementwriters.com/services/mba-personal-statement-writing/getting-mba-degree-with-yale-school-of-management-starts-with-admission/ is also aimed for providing online information to the users so good ojb. Thanks for sharing such a long list as this is the time for all the participants to gather the information regarding their exams and navigate here from the behind because many of them are not up to the mark to progress in the best manner. It is remarkably enthralling that you have imparted useful hints to regard to thriving. These tips will help to find out here now heathy and solid, I would in addition love to give these profitable tips to my companions. Since everybody ought to be solid. I figure, magnificent should through and through act with their kids in the issues of getting planning as, two or three youngsters feel upbeat on riches. Their kin should state them that riches can be https://www.nursingpersonalstatement.com/ grabbed from us on at whatever point at any rate the genuine riches planning can't go wherever.